Jacobsburg Historical Society Archives comprises materials that document the lives of the descendants of William Henry of Lancaster (1729-1786), who learned the trade of gunsmith in Lancaster, Pennsylvania, in the 1740s. The earliest documents in the Archives date to these years. Some papers relate to William Henry II (1757-1821) and his children who built and operated the Boulton gun works, J. Joseph Henry (1786-1836) and William Henry III (1794-1878). But the bulk of the materials concerns the family relationships and civic contributions of James Henry (1809-1895) and his extended family, particularly James’s son and last of the family gun makers, Granville Henry (1834-1912), and the family of Granville’s daughter, Mary Adeline Henry (1873-1974) and her husband, Dr. Thomas Henry Atherton Stites (1875-1959). 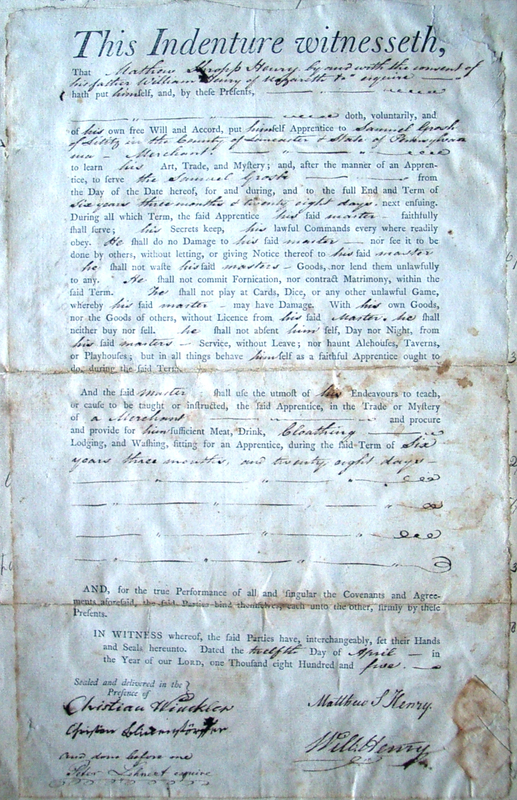 This 1805 apprentice agreement bound the fifteen year-old Mathew S. Henry for six years to a Lititz shopkeeper. The signatures of Mathew S. Henry and his father, William Henry II, are present at the bottom of the document. A detailed Finding Guide for these papers was produced in 2006 and is presently being revised to integrate additional materials. This Finding Guide arranges these papers into eight sections: correspondence, writing and school materials, biographical, legal, financial, Moravian materials, gun works records, and photographs. The bulk of the collection is correspondence, and much of the material is genealogical and biographical in nature. In the 1880s, most of the family papers were still in the possession of James Henry and his son Granville Henry at Boulton. Over the next few decades, however, many papers, including abundant materials related to William Henry of Lancaster’s activities during the Revolutionary War, were transferred to the Historical Society of Pennsylvania, where a Henry descendant, John Woolf Jordan, worked. These papers, interleaved into seven large volumes, can be found as the William Henry Papers, 1759-1826 (collection Am.513), Historical Society of Pennsylvania (Philadelphia, PA). The vast family papers that remained were further divided in the 1960s. Most colonial-era papers and most papers related to the Boulton gun factory were given to what is now the Hagley Museum and Library (Wilmington, DE) and can be found there as Henry Family Papers, 1759-1909 (accession number 1209). In practice, however, this division of materials was not made cleanly: some personal family papers now reside at Hagley and some papers related to the Henrys’ gun business remain in the Jacobsburg Historical Society Archives at Boulton. JHS has inventoried and now digitized these papers and is slowly making these digital materials available here. If you are a researcher with questions about the Jacobsburg Historical Society Archives, please consult our schedule of charges and contact Scott Paul Gordon (Lehigh University) at spg4@lehigh.edu with requests or questions.